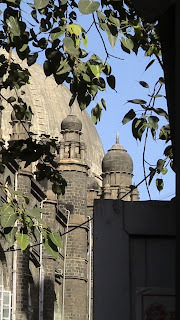 MUMBAI, the commercial nerve centre of India is very much like a victorian city, especially the area around the fort. One of the fort's remarkable buildings is the GENERAL POST OFFICE built in the style of INDO-SARACENIC design. The building had been designed by JOHN BEGG, who with his fellow architect GEORGE WITTET had established the INDO-SARACENIC style of architecture in British India. Considered as the most well known design, the GENERAL POST OFFICE was completed on 31st March 1913 at a total cost of Rs. 10, 09, 000. 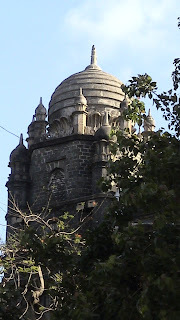 The central dome of the building strongly resembles with the GOL GUMBAJ of BIJAPUR. 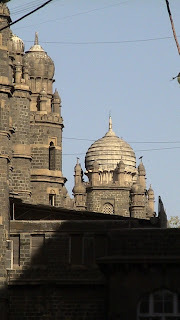 Ten Heritage Walks of Mumbai - by Fiona Fernandez - published by Rupa and Co.
As a child I liked learning HISTORY, not because my history books were excellent or I studied in a good school, but due to a teacher, Sri Gopal Chandra Das. I was exposed to learning HISTORY not through the conventional reading, but through live experiences – meeting people and visiting places, not the exotic ones, but the ones that surrounded the town I lived. My teacher, Sri Gopal Chandra Das often took me to places, which were offbeat, yet rich in life located around a small town called Sambalpur in western Orissa. As I grew old, I moved to PUNE’s Deccan College to peruse my career in ARCHAEOLOGY. Deccan College transformed me into a professional ARCHAEOLOGIST through offering a much broader view on the wonders of HISTORY. 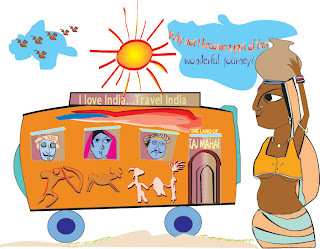 I travelled extensively in the countryside of Maharashtra, Karnataka, Gujarat, Rajasthan, Madhya Pradesh and Orissa. During these travels I could sense the pulse of our country rooted deeply in the wonders of historical past. The great cultural diversity of India has been achieved through long experiences of contacts, migrations, political turmoil, disasters and celebrations of life. Yet the humanity has survived against all these ups and downs – it was the ideas that brought solution to the crises. Since 2003 I have been involved with SCHOOL EDUCATION, working with a company called EDUCATIONAL INITIATIVES (www.ei-india.com), based in AHMEDABAD. I work with EI as a test developer in SOCIAL STUDIES. While interacting with children and through retrospection of my own experiences I realized that the subject of HISTORY could be made interesting, if we shift the focus from the ‘HISTORY OF EVENTS’ to the ‘HISTORY OF IDEAS’. 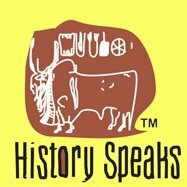 HISTORY SPEAKS aims at making HISTORY not only interesting but meaningful in the contemporary life. HISTORY SPEAKS aims at promoting historical ideas in the context of daily life. The idaes may varry from political innovations to games, and culinary practices to gardening. To cite an example is the game of cricket. Criket as an idea evolved in the 16th century Europe and the first official international cricket match was played in 1877 in England. HISTORY SPEAKS would not give priority on the event of the 1877 match, but would focus on the idea of cricket that has evolved through time and space. HISTORY SPEAKS aims at popularising OFFBEAT PLACES OF INDIA, which have rich historical treasures, yet not known to the common people. One such offbeat place is MANDVI in the Kutch region of Gujarat. It is a small town with a rich history. MANDVI had been an active port for more than five hundred years. It flourished as a port until when KANDLA on the Gulf of Kutch was made into a major port of the country. Today, MANDVI's glorious past is reflected in its numerous heritage buildings scattered through out the old town. MANDVIis also known for its unique boat building tradition. There are interesting people who live in MANDVI, yet they are not much known to the common men. HISORY SPEAKS would try to bring the interesting facets of their life from time to time. Another area where HISTORY SPEAKS would focus is the FUSION OF IDEAS. India has a long historical tradition and inhabited by people of various ethnic groups. Today the country is at the cross road of globalisation. 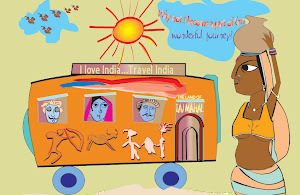 Through out the history of India there has been cultural interaction between ethnic groups. Such interactions have allowded evolution of composite cultures, which are reflected in the various forms of cultural practices, such as food, art, architecture, music, clothing, dance, and so on.